Today, I will do my best to portray you some of the best drones for kids that are most suitable for children of all ages. That’s why we have divided this kid friendly drones list into several different age categories so you can better understand the models available on the market. In addition to that, we will also give you a couple of safety tips as well as a general introduction you should explain to your little ones before their first flying session. As I will mention several times going forward – drones are not a toy! With that being said, let’s take a closer look at drones for children. Syma is a well-known brand in the lower end kid friendly drones’ category, often called drones for children category. They have a wide variety of available models, some of which are real hidden gems. One of them is definitely this dirt cheap X11C model which will definitely turn quite a few heads its way. It sports s sleek design with detachable prop guards that ensure propellers are safe and sound even during powerful collisions. The best thing about this one is definitely the fact that it sports a camera. It’s nothing special, just a 2MP sensor capable of capturing low res images. With a fancy controller design, intuitive controls and a button that makes the Syma X11C roll around like crazy. Continuing onward, it’s important to state that it’s great for children as it sports flashy LED lights that make up for a proper show during night time. This drone for kids has an operating range of 30 meters. Flight time is better – up to 8 minutes with a charge that lasts about 40. All in all, Syma X11C is an outstanding, entry level drone that seems like the perfect choice for children to learn the basics of drone piloting. If your children are just past five, I would seriously recommend you getting a miniature kid friendly drone. Not only will it improve their motor and cognitive skills but will also give them plenty of entertainment both outdoor and indoor. 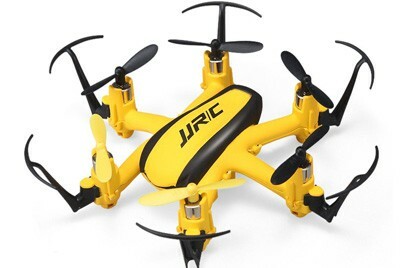 JJRC H36 cannot be considered as a fully-fledged drone. It is more of an indoor model that doesn’t have much power under the hood. Despite that, it would be a mistake to think of it as a toy. With its solid build quality and all-around prop guards, JJRC H36 can withstand quite a few hits. Last but not least, JJRC H36 can last up to 6 minutes in the air and takes around an hour to charge (a bit less actually). Likewise, its operating range hovers around 30 meters which is more than enough for casual indoor use. All that makes it great drone for 6 year old kid. 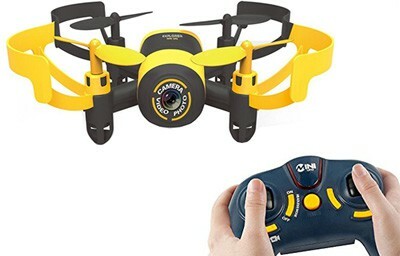 What is your opinion, do you agree this is one of the best drones for kids? With more than 3,000 satisfied customers, Holy Stone HS170 is definitely the biggest hit on Amazon… at least when it comes to drones for kids. This miniature drone features a spectacular design accompanied by good hardware and great stability. Of course, since we are talking about a drone for kids, you cannot expect high speed maneuvers and all that borderline-dangerous traits. Instead, Holy Stone HS170 offers an easy learning curve for new users. They’re bound to appreciate every last bit of it, I guarantee it. I reckon some of you doubt this thing can even takeoff without any sort of issues… solely because of its insanely low-price tag. But that’s not really the case. You see, Holy Stone HS170 is a well-respected brand with several great models. Including them is this one and it actually has solid specifications. For instance, it can fly around for 6-8 minutes and fly away from its transmitter up to 50 meters. It takes roughly an hour to charge it back up. However, I suggest buying several extra batteries as well as chargers to bring this baby to its full potential. First things first – Holy Stone HS170 does not come with a camera. While that could be an issue for more experienced flyers, I doubt beginners will mind at all. This will give them a distraction-free learning experience. Even more so considering this birdie sports headless mode. You can learn more about it below. For now, let’s just say that it offers an easier controlling mechanism and is the perfect choice for first-time flyers. 6-axis gyro stabilization is here, but I suppose I don’t even have to mention that since every new drone has it. 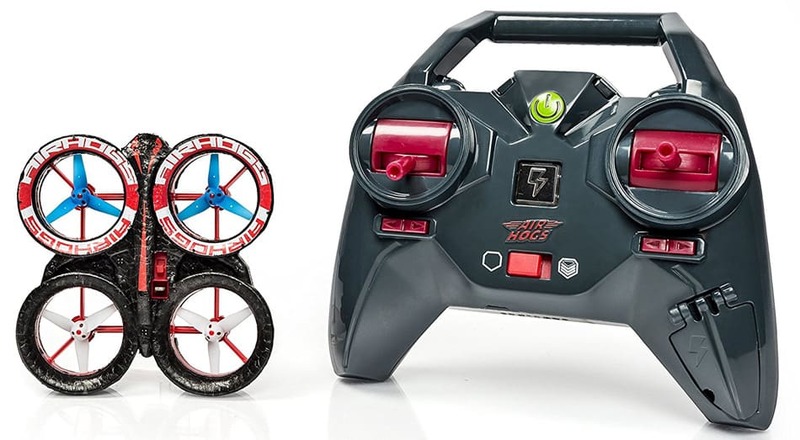 All things considered, if you want a dirt-cheap best drone for 6 year old kid, drone which has already made thousands of children thrilled, then I suppose you have no other choice but to go for Holy Stone HS170. Air Hogs is another top tier brand when it comes to entry-level drones for kids and teens. With a whole bunch of exceptional models behind them, it is safe to say they’ve made a lot of children happy. Today we are going to be focusing on their Helix Ion model. It’s basically a miniature drone most suitable for indoor use. While it can perform somewhat decently outdoor too, I suggest you keep it indoor-only. Why? Well, it’s really small and wind could blow it away… Now that we have that out of our way, let’s talk about its specifications. Afterwards, we’ll see what sort of features does it have to offer. Let’s go! There is nothing to add or deduct as far as the specifications are concerned. Once again, this is primarily meant as an indoor drone meaning you won’t be able to get much range from it. Roughly 20-30 meters at most, but I doubt your house is nearly as long. Operating time is good too. Needless to say, this is a 1S brushed drone for kids with ducted fan technology meaning it doesn’t require that much power. With that in mind, you can expect around 6 to 8 minutes of battery duration if you don’t push it to the limits during the entire flight time. Since Air Hogs Helix Ion does not have a camera, I guess we can move on its features straight away. I’d like to start off with its design. Why? Because it’s amazing. Even though its really cheap, there were no manufacturing cuts in terms of build quality. This thing is sturdy and durable, well-capable of enduring a fair share of crashes. It sports a ducted fan design with 3-bladed props around which are thick foam prop guards surrounding the drone in its entirety. You can do all sorts of flips and tricks with it thanks to its 1-key flip command. Furthermore, it sports a sleek controller too which goes nicely with the drone itself. All in all, the overall packaging and presentation is great, the drone is even better… As a matter of fact, I don’t see any downside to this one. Should we call it the best drone for 6 year old kids? Here we have another kid friendly drone made by Air Hogs. This time around we’ve slightly upped the price and size of our showcase drone. Millennium Falcon is a much bigger quad than Helix Ion. That’s why it’s not only suitable for indoor but outdoor use as well. Plus, I don’t need to remind you that we’re talking about one of the most popular spaceships in the history of cinematography. So, take all that into consideration while we move forward… We’ll try to find out whether or not this thing can still outrun Imperial Star Destroyers. 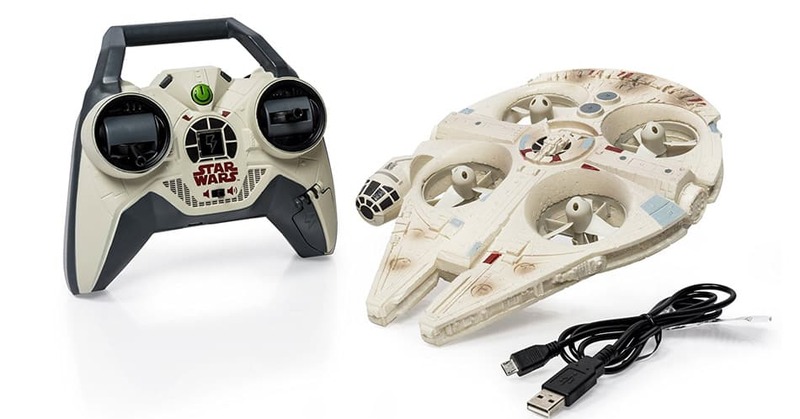 When it comes to specifications, Air Hogs Millennium Falcon does itself justice. Especially when compared to Helix Ion. This birdie can provide with great speeds and agility, but retain somewhat of a stable flight. As far as its numbers go, it’s pretty solid too. Air Hogs Millennium Falcon can go as far as 60 meters away from its controller meaning you can easily go out of your backyard… unless you’re a millionaire and have a freaking golf course. Battery duration goes anywhere from 5 to 7 minutes. Even 8 if you are not going full speed all the time. Just like Helix Ion, Millennium Falcon does not have a camera either. But, to compensate for it, this little bugger sports insane stability and intuitive controlling mechanisms. There’s no doubt kids will be able to fly this thing. But this is not all, there are several more aspects to this little bugger that I’m dying to tell you all about! Let’s start off with its sounds. Yes, this thing produces sounds, and I am not referring to its propellers. It is able to mimic the real sounds of Millennium Falcon just like in the old Star Wars movies. With colorful LEDS and engine sounds, you’ll be thrown back to your childhood like never before. Last but not least, I should also say a thing or two about design of this drone for kids. It sports roughly the same foam-ish build which is highly impact resistant and crash proof. But all in all, if you want to share your Star Wars love with your kids, get them one of these buggers. You’ll both enjoy it, I can already tell… Now when we know what it the best drone for 6 year old kids, let see what is the best drone for 9 year old kids ! X5C-1 is an upgraded version of X5C that comes with a HD drone camera for shooting medium-quality aerial photos. It’s nothing special so don’t oversell it to your kids. Despite that, Syma X5C-1 is still an incredibly fun model that can be a good jumping board for your kids regarding drone hobby. While I personally am not a huge fan of the design, some of you might find it pretty. I find the abundance of small decals and whatnot way too tacky, but that’s just a personal opinion. What I do like about Syma X5C-1 is its controller which is accurate and provides a user-friendly experience. Moving forward, this little kid friendly drone is powered by a 3.7V 500mAh Li-Po battery which is a bit more powerful than that on Wonder Chopper Stunt Drone. IT can last up to 7 minutes but unfortunately takes a lot of time to charge… To be more precise, around one and a half hour. Still, with 30 meters of drone operating range and decent flight time (especially considering its price tag), this thing is more than capable of entertaining your kids. 9-yearolds will probably be satisfied with any of the 3 models featured above. But, if you really want to sweep them right of their tiny feet, you should consider going for one of these 2 baddies. First in line is Holy Stone F181W. This best drone for 10 year old kid comes with a great camera featuring FPV. Other than that, it also has bright LEDs and a console-styled controller. There’s no doubt the latter will be home territory for your kids… But there’s more to this drone than all this… let’s see what else can it do and why exactly should it be among your top options. As for specifications, Holy Stone F181W does not fail to deliver. This insanely popular entry-level drone for kids comes with a 1S 750mAh battery. It might not seem like a lot at the first glance, but trust me – it’s great. That’s partially so because it only takes an hour and a half to fully charge up and partially because it can produce anywhere from 7 to 10 minutes of flight time. On top of all that there is also operating range. Holy Stone F181W is sure to provide a good number here too since it can reach all the way to 80 meters. First of all, let’s say a couple of things about this birdie’s camera. As you can see, this is not an integrated but a tight fitted one underneath its body. It is guarded by the legs which are, luckily, out of its 720p-capable sensor’s way. They don’t interfere with the image in any way. As I’ve told you above, Holy Stone F181W sports WiFi FPV. The distance is good, but nothing spectacular – around 20-30 meters. Furthermore, Holy Stone F181W incorporates adjustable flight speed, 3d flips, and one key return to home. It’s not powered by GPS though, so don’t expect pinpoint accuracy with this one. In the end, considering the price this little bugger goes for, there is no doubt in the fact that it’s well worth buying. 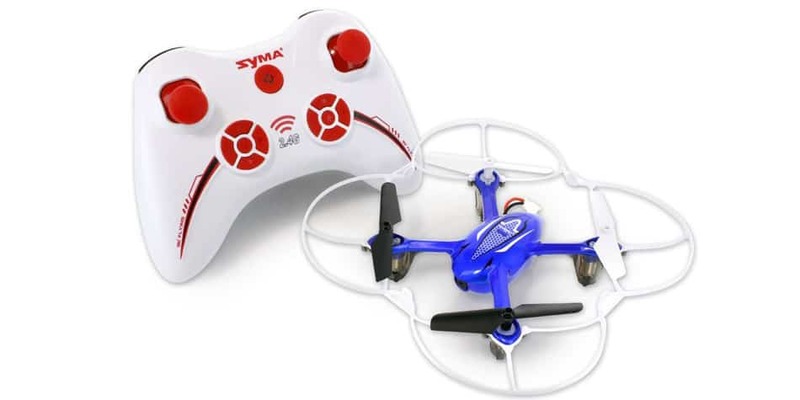 UDI U818A by USA Toyz is, by far, the most popular drone for kids in the under $100 category. That’s because this little drone for kids features a solid design and is finely poised with excellent build quality and performance. Feature-wise, UDI U818A features headless mode which makes controlling much easier to drone beginners. 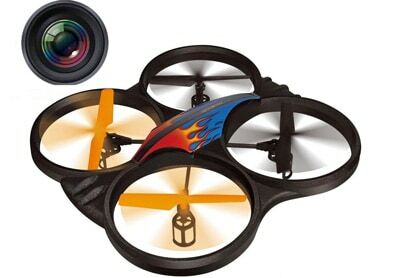 Likewise, it also features 6-axis gyro stabilization system, LED lights, 1 button 360 degree flips, and a 2MP camera. It even comes with a 4GB micro SD card for storage as well as an extra battery for prolonged air time. The camera isn’t that good but can still shoot 720p videos at 30fps and take solid aerial shots for any occasion. Each battery can provide you with up to 10 minutes of flight time which means close to 20 minutes if you charge up and use both of them. Combine that with up to 60 meters of flight range and you’ll understand why people are going crazy about UDI U818A! Best drones for kids needs to be simple, easy to use and easy to maintain… And all those traits come in one single model – the Altair AA108. Plus, it’s just been released so you can go ahead and grab it while it’s still in stock. I reckon it’s going to be in high demand so you might want to hurry up. Why should you buy this drone? Well, if those traits above didn’t sell it to you, perhaps the rest of its array of features (and specifications) will do the trick. The first reason why kids will love this drone is not its performance. Nope! It’s the gorgeous design which will turn quite a few heads in its direction. However, the design is only the first thing kids will notice. Besides design, they’ll also experience an incredibly stable flight that will make them fall in love with drones. Plus, Altair AA108 has altitude hold (among other features) which greatly helps with stability too. If your kids want a drone that can record aerial videos, Altair AA108 can provide with its 720p wide angle camera. It’s capable of recording brilliant videos and snapping crystal clear photos that they’ll share with you all the time. The fun with this little birdie will last for approximately 10 minutes per charge. Don’t forget to warn your kids that this kid friendly drone, Altair AA108 can only fly up to 100 meters away from them. That will minimize the risk of them losing the drone and you having to buy a new one. All this considered, we can produly say Altair AA108 is the best drone for 10 year old kid. Now we have reached a very popular drone made by one of the most known entry-level drone brands out there. As the title implies, I am referring to UDI and their U818Plus model. Let’s get one thing straight at the beginning – even though this is an entry level drone, it sure can provide quite a lot of fun. It’s cheap too so it really delivers on all fronts… But, how good can it be considering its dirt-cheap price tag? Well, that’s what’s great about this one – it is both cheap and high quality… and we don’t see that very often these days. UDI U818Plus is one of those drones that can be used both indoor and outdoor. That’s thanks to great build quality and thick propeller guards that surround it at all sides, there is no way you can hurt yourself or others (or your property) with this drone. As for the actual numbers, I am sure UDI U818Plus won’t disappoint you. That is because of its 12 minutes of flight duration which is quite the feat in this section of the market. Not only that but it also has long range, clocking in at roughly 150 meters. As far as camera is concerned, UDI U818Plus continues with its fair share of quality. We are talking abut a solid 2mpx camera nicely tucked away in a needlessly large container. That’s probably to make it look like one of those expensive Zenmuse imaging solutions. Other than that, it’s also worth mention its WiFi FPV which works up to 50 meters… or less, depending on your smartphone. Features are not a downside either. With altitude hold, headless mode and one key takeoff/Landing, UDI U818Plus has a lot to keep you busy. Specifications of this little bugger are outright amazing. It delivers slightly improve performance in comparison to its predecessor, Bugs 3… and we all know what a beast it was back in its days. MJX Bugs 2W takes that one step further with its 15 to 18 minutes of flight time. No surprise considering its lighter and smaller than Bugs 3. It’s powered by a hefty 1800mAh 2S LiPo battery but, unfortunately, won’t work with 3S ones like its predecessor did. And finally, its operating range goes around 500 to 800 meters which is praiseworthy by all means. If you did not notice already, this little birdie has 2 giant eyes (hence the name Bugs) with a miniature camera housed underneath. And it’s a really good one, for that matter. MJX Bugs 2W camera can record aerial videos in 1080p which is a great feat coming in at this price point. Furthermore, that W in its name represents its WiFi FPV capability. It can go anywhere from 200 to more than 500 meters, depending on your smartphone. Please keep in mind that it uses 5Ghz WiFi meaning you need a device that works with 802.11ac frequencies. Features-wise, MJX Bugs 2W has a lot going on. We are talking about a GPS powered drone here. This means it has access to smart features such as Return to Home and Altitude Hold. RTH will, as its name suggests, return your drone back to its initial takeoff location. On the other hand, AH will simply keep it at a constant height without manual interaction – great for taking selfies. Last but not least, MJX Bugs 2W also sports headless mode which is something beginner-flyers will greatly appreciate. Another one of Parrot drones – Bebop 2 is a huge upgrade over the AR 2.0 Elite. Not only does it come with a dedicated Skycontroller 2 that boosts its range by a LOT, but it also comes with VR googles. They will allow you an immersive drone flying experience and that’s something none of the above featured models support. In addition to virtual reality, it is also important to mention that Bebop 2 excels at other aspects as well. Take for instance its FHD ready 14mpx camera that sits on a 3-axis digital stabilizer. It’s capable of producing top notch aerial footage and give you a great perception of your surrounding area. Parrot Bebop 2 is equipped with a 2700mAh battery that can endure more than 25 minutes of flight time. Skycontroller 2 boosts the range to more than 1 mile and, in addition to everything else stated about this one, completes the package with straight A’s! Do you think this is one of appropriate (advanced) drones for children? A lot cheaper than DJI Phantom 4, Phantom 3 still serves its right and has not yet been completely forgotten. This state of the art drone might not feature a ton of sensors, an incredible 1-inch camera lens or all those fancy things… but it still has all the essentials that make up a class A drone. Class A Drone that is definitely one of the best drones for kids. It won’t cost you too much (compared to last generation of Phantom series), but it will give you all you need. Safe and reliable drone with great flying characteristics. It sports a great 2.7K 12mpx camera mounted on a 3-axis stabilization system. This will allow you to record eye soothing aerial footage as smooth as silk. Of course, it supports FPV… and what’s even better – in HD! Moving forward, it’s important to mention P3 comes with all the standard smart features such as follow me, course lock, waypoints, orbit and even a vision sensor for indoor use. All of these features were brought to life with GPS technology. Speaking of technology, DJI made sure their Phantom 3 is an absolute champion when it comes to specifications. You’ll have to agree that’s true since it can go as far as 1 mile and as long as 25 minutes. If you are not satisfied with these numbers, feel free to go for the Advanced or Pro version since they offer more than double the operating range. This mode is bound to help you a great deal during your first flight. If you have problems with controlling your drone for kids in normal way, then try giving headless mode a go. Once headless mode is turned on, you don’t have to pay attention to your drone’s orientation. Instead, you only need to focus on where it’s going. If you jaw right, it will jaw right, if you pitch back it will pitch back… no matter where it’s currently orientated. It doesn’t get much simpler than this. This is another beginner-friendly feature that will make your flying a lot easier. Headless mode enables worry-free controlling and altitude hold enables worry-free elevation. It basically keeps your drone hovering at a constant altitude without you having to manually adjust the throttle stick. This feature is especially useful to aerial photographers as it allows them to take their minds off of controlling and onto taking the perfect aerial shot. Stands for First Person View; FPV enables you to see exactly what your drone’s camera is seeing. And in real time! Just think about it – you can get an amazing flying experience by combining an FPV-ready drone with a specialized VR headset. Take full control over your drone and fly wherever you want. Keep in mind though – don’t turn on headless mode while flying in FPV as it will mess up your controlling scheme and give you a crash landing. In case your first flight ends up with your drone going out of your line of sight, I’m sure you’re going to be scared. Heartbeat will go up to a 100 and you’ll start worrying about the safety of your kid friendly drone… and potential people below it. Having a flyaway drone is a true nightmare to all drone enthusiasts. But luckily, there is a feature that prevents it from happening. It is called Return to Home and, quite frankly, it does exactly what you think. It basically returns your drone to its takeoff location thanks to onboard GPS module. So, if you happen to lose your drone during flight, simply push the RTH on your controller and it will return back to safety. 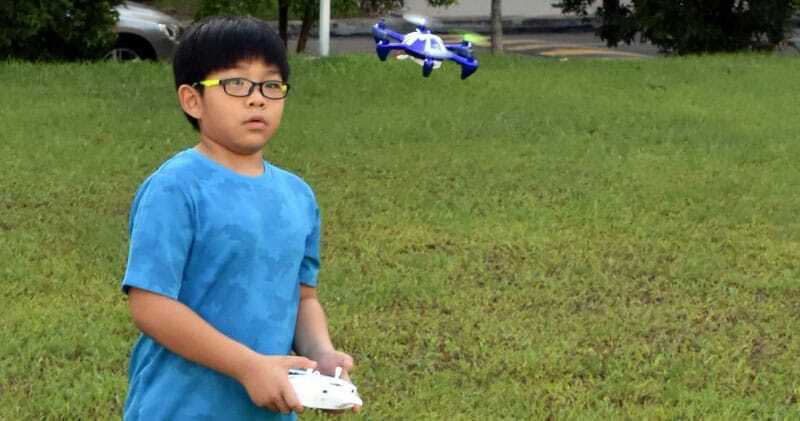 Are kids allowed to fly drones ? Kids are allowed to fly kid friendly drones. There is no law that prevents them from doing so. Still, it might be a good idea for you, as a parent, to double check with your country’s (state’s) UAV laws. If everything seems fine, I would still recommend you to follow certain safety tips to prevent your children or unsuspecting fellow citizens from going hurt. Below, you can find a small safety tips section in which I mentioned the most common issues when it comes to drones for kids. In addition to those tips, I’d also like to remind you that younger children (under 10 years of age) should always be under supervision of their parents while flying drones. It’s just a safety precaution that should never be taken for granted. The biggest safety tip is not to fly a drone for kids around unaware people. Even though modern day drones are equipped with technology that prevents them from shutting down completely while in mid air and crashing down onto unsuspecting citizens, there’s still a (small) chance of something going wrong. So, to prevent a potential disaster, make sure your kids fly their drone either in your backyard or somewhere far away from people. In addition to that, make sure your children stay away from airports (at least 5 miles away) and that they don’t raise it higher than 400 feet in the air. Lastly, not all of the below featured drones are outdoor-only. I placed a couple of smaller drones that are suitable for indoor use so your children can learn the basics of piloting without ever leaving their home. 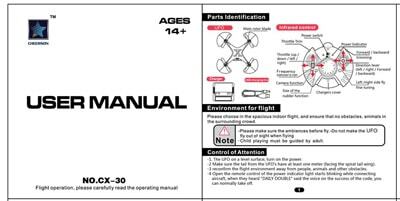 I know for a fact that many of you throw away the manuals that come with drones. Not just drones but virtually any other product you purchase. While that’s ok in most cases, when it comes to drone it is terrible practice. Why? Well, even though every drone functions in roughly the same manner, there are still significant differences between them. These are most often related to the controlling schematics or advanced functions and are extensively explained in the manual. That’s why I strongly recommend to take your time and read through it. Who knows what sort of useful information you’ll find there. One thing is for sure though – it will help you amaze your children with your brand new drone knowledge. If your children are flying their drone around and it suddenly stops working, there’s no need for stressing. Or worse – I know for a fact that many people throw their drones away right after their first malfunction. And I am talking about almost fully functional drones which usually have an issue fixable in less than 5 minutes. Most frequently, either ESCs or motors are the first hardware to take the fall. They are both easily replaceable and don’t cost a fortune. It requires a bit of soldering which can be a fun way of introducing your children to this process. Furthermore, perhaps the battery drained out. LiPo batteries can die if they’re left without a charge for too long. If you don’t plan on using them, make sure you charge them up at least once a month. What I’m basically trying to say here is – don’t throw away your drone after the first malfunction. Take it apart, identify the issue and see whether or not its worth fixing. In 90% of cases, the fix will require an $5 purchase and 10 minutes of your time. Take that as a great opportunity to bond with your children. You’re welcome! Paragraph above led me to writing this one. As I have previously mentioned, drones are not only entertaining but can also serve as great learning tools. In addition to 3-directional control, you can teach your kids a great deal on how drones actually work. Stuff like, how to connect motors to the flight controller or how to solder camera, receiver and other interior electronic pieces. I know, I know… this isn’t the kind of stuff you can teach 5-year-olds. But, 9 and above are already well-capable of doing these tasks on their own, with just a little bit of help and supervision during the first couple of tries. Go ahead, try teaching them something new and I guarantee that they’ll form cheerful memories that will last forever. In the end, I really don’t know what else is there left to be said… I’d just like to conclude this article with one simple sentence that’s been stuck in my mind since the very beginning – “Drones are not toys. They might look like they are, but guess what – they’re not!” Even the smallest ones can injure people if not controlled appropriately so it is important to teach your children how to fly them. Start off with smaller models and then learn your way to the top! 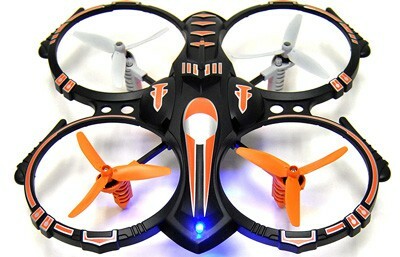 This cool looking hexacopter has been granted the 4th spot on my list. That’s because it can hover steadily in air with its altitude hold feature (works best indoors though, so keep that in mind) which makes it an exceptional starting drone. Children can really learn a lot from this one, not only because of the altitude hold feature but because of headless mode as well. What’s even better is the fact that Wobox H20H supports one button course reversal which can pull you out of sticky situation with a blink of the eye. So basically, it is without question that this little fella is a great beginners drone that can teach your kids more than a few things. Wobox H20H has the same operating range just like the GoolRC – 30 meters. Fortunately, its battery is a lot better. Not only does it last a bit longer (approximately 7 minutes) but it also charges up for half an hour which is great. Definitely one of best, if not the best drone for 6 year old kid. 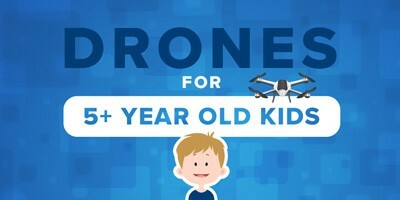 If you’re more into drones for kids with camera, this might be what you’re looking for. 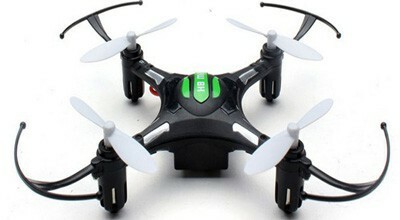 This is another mini drone just like its name suggests. It is made by a company called JXD and sports a sleek design. Even though its build quality is not exactly the best (it’s made out of cheap plastic materials), it can still survive a couple of crashes due to its prop guards that protect the entire drone on all sides. The feature that is going to amaze children the most is definitely the addition of LED lights that will enlighten night flying sessions. Additionally, JXD 512V also features 360 degree eversion as well as one button 3D flip which is also incredibly entertaining to younger audiences. As was the case with all other above featured mini drone,s JXD can also be flown both outdoor and indoor. Still, the latter will make up for a much better experience as wind tends to be quite the issue while flying outdoor. Best of all, it comes with a 6-month warranty so there won’t be any worry on your end! Lastly, JXD Mini can fly around for roughly 4 minutes (a bit less than we’d expect) and can go as far as 30 meters away from its controller. Finally, the best drone for the youngest of children is definitely Eachine’s H8 Mini. Even though it might not seem like the best one out of the bunch, it provides its uses with a great value for money. It’s true! You can get this thing for less than what you’d pay for a proper lunch in a restaurant. Way less! Despite its incredibly low price tag, Eachine still impresses with solid design, prop guards for maximum safety and even LED lights that seem to be very popular within this price range. Moreover, Eachine H8 Mini also comes with 3D tumbling key as well as a lightweight frame that can endure quite the beating. Believe it or not, this thing comes equipped with the popular one key return to home feature which is rarely seen with such cheap models. Likewise, it also has headless mode that makes it much more intuitive to children. All in all, if you’re looking for a cheap toy drone, you cannot go wrong with H8 Mini by Eachine! Now we are moving toward bigger, more powerful and pricier drones that are suitable for children older than 9. This first one is made by Wonder Chopper and features a gorgeous design with built in prop guards and LED lights for ultimate fun. As its name suggests, this thing is made for stunts. It is insanely agile and glides through the air with ease. It is durable too. With reinforced propellers and above mentioned prop guards, you do not have to worry about this thing breaking that easily. The controller looks good but isn’t exactly made out of the highest quality materials. Still, it sports intuitive and lag-free controls which is, at the end of the day, what matters the most. Specifications aren’t much better than those previously featured models. The Li-Po 3.7V 300mAh battery can endure up to 6 minutes of air time. Likewise, the connection is stable up to 50 feet away which means you won’t be able to get it too far from you. 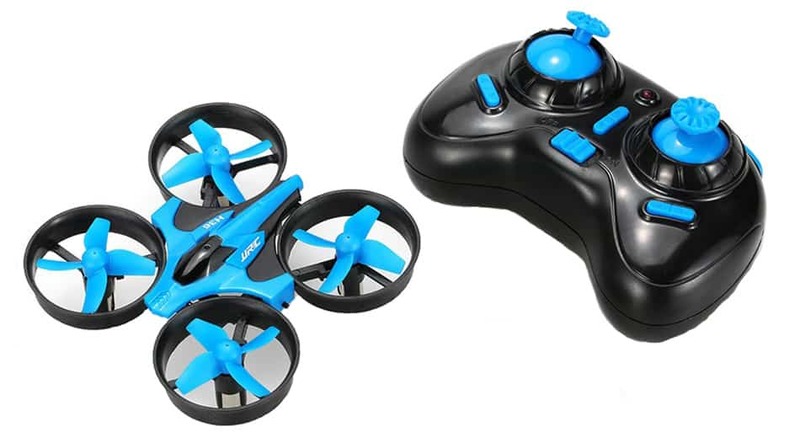 If you are looking for an extremely durable drone that your children won’t be able to break down even if they try, then Haktoys has a solution for you! 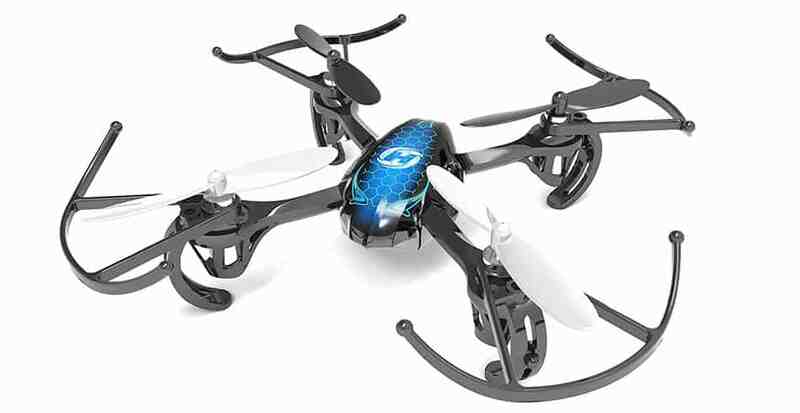 Meet HAK907C, a robust drone with excellent build quality and solid performance. Its main features are 3 speed modes, LED lights and auto stabilization which greatly helps HAK907C to battle tough weather conditions outside. It even features a miniature camera. Unfortunately, it does not have a good sensor so you will be left with low quality footage… But that’s not so important since this is a children’s drone and not a fully-fledged aerial photo platform. When it comes to specifications, Haktoys HAK907C brings an impressive sheet to the table. With up to 100 meters of seamless operating range and roughly 10 minutes of flight time, it is pretty clear that the folks over at Haktoys know what they’re doing. So, once again, if you’re looking for a durable and well-performing drone, HAK907C is the one you should be looking for! Moving onto the big boy drones, first we have AR 2.0 Elite by Parrot. 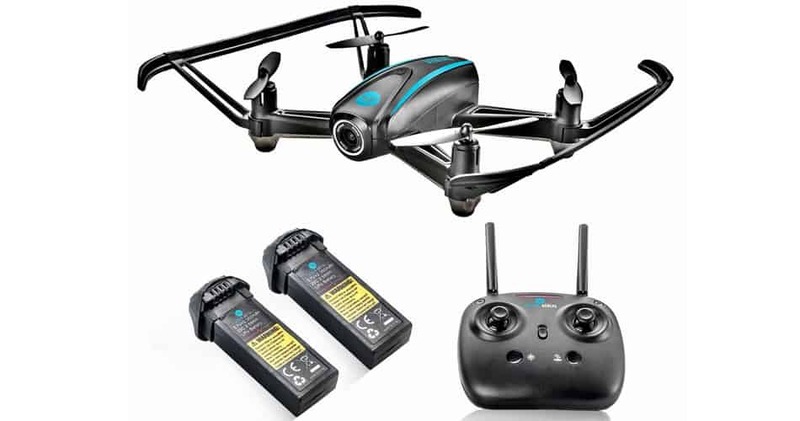 This is a really popular drone with a sturdy design and great characteristics that make it enjoyable to both teenagers and young adults alike. It is controlled by a smartphone (iOs or Android) via dedicated app that provides a plethora of available functions and features. In combination with the built-in camera (good quality by the way), Parrot AR 2.0 Elite’s app can record and share photos and videos straight from the drone. Additionally, it also supports FPV which is something a lot of potential customers will greatly appreciate. Unfortunately, it does not come with failsafe functions so you will be up against all sorts of troubles if you fly it past the operating range of roughly 50 meters. The battery is pretty solid and can provide with up to 12 minutes of flight time. 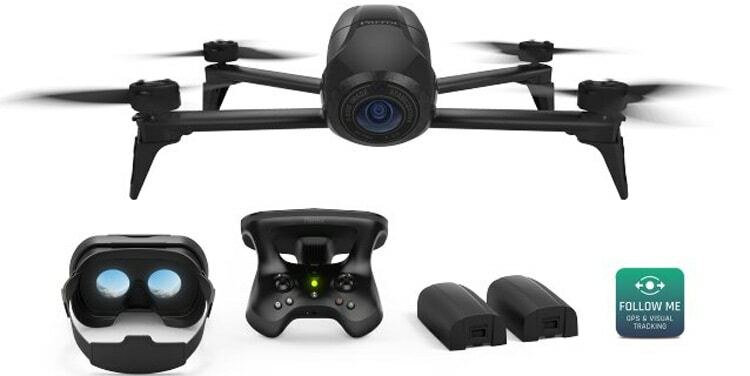 All in all, if you’re looking to provide your teenager with a good all-around drone that won’t set you back by a lot of money, then Parrot AR 2.0 Elite is the best option for you! Need a drone that can follow you automatically ? Look no further !